BRWAlliance - Time To Stop the Hog Farm! 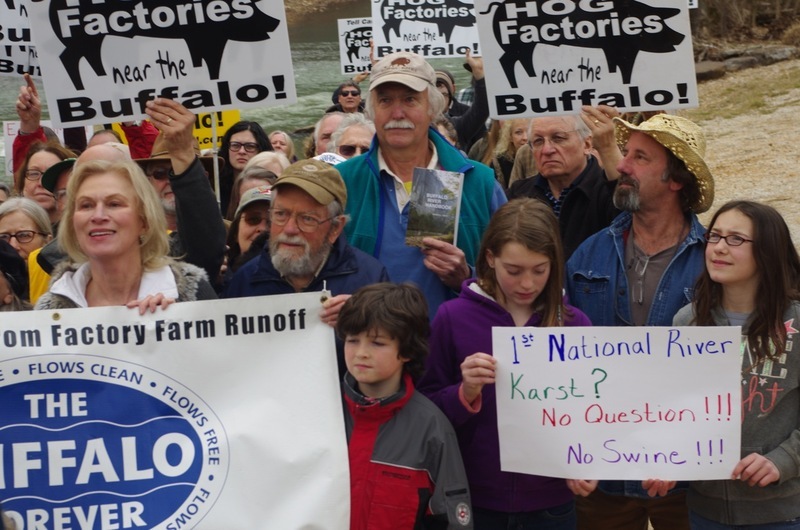 The Buffalo River Watershed Alliance, which is pressing the case against a hog factory feeding operation in the watershed of the national river, objects to the hog farm's request to be allowed to continue operating despite failing to meet regulatory requirements. The Arkansas Department of Environmental Quality, after lengthy deliberation, last week denied a new permit for the C and H hog farm at Mount Judea. It said there wasn't enough information to justify disposal methods for huge amounts of hog waste in ponds over the limestone subsurface that could allow leakage of waste into the Buffalo River. The denial means the farm must shut down, but it has asked for a stay of the decision. The appeal could take months, or even years, the Alliance says. The Alliance opposes a stay for a permit that expired more than a year ago. It favors a phase-out of hog farm operations. If a stay is granted, it said, C and H should post a substantial bond sufficient to mitigate any potential damage from hog waste.